Working from home is becoming an everyday conversation in many households. Is working from home possible? Where can you find a good career? Who works from home? So many questions with no definitive answers. Welcome to the first-ever podcast by Jacky and Justin. All of the questions above get answered, along with a few more! As the amount of technology we use every day grows, the amount of available careers where you are working from home has increased. Many people such as military spouses and stay-at-home moms have started working on their computers and earning an income from the comfort of their own homes. Talking about the legitimacy of it, the demand for it, and even answering whether or not they could do it themselves; Jacky and Justin try and make sense of this growing trend. Make sure you subscribe! Click the button below to listen to the Jacky and Justin Podcast on iTunes. The idea of this podcast came from a casual conversation, and there just isn’t enough of that from colleges. 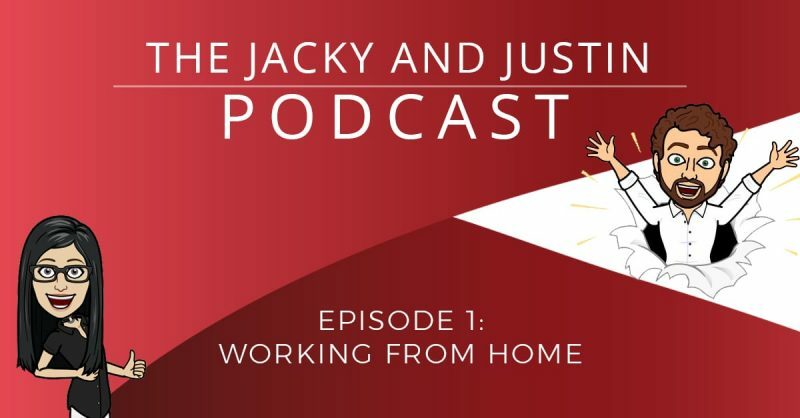 Jacky and Justin step away from their day jobs to talk about different topics and dive into all aspects of them. Inspired by conversations had with students, graduates, potential students, clients, employers, and business professionals, Jacky and Justin aim to talk about topics that interest you. Hoping to shed light where there may be confusion, or teach people about something new to them. This podcast will feature special guests from the industry, and topics can be driven by you, the listener. Comment on a post or send an email to request a topic of conversation.